THE WESTERN Ghats of Maharashtra are famous for producing Alphonso mango. But the focus on this premium variety due to a huge demand for it has resulted in a neglect of the native varieties the region has grown since ages. Some of these are on the verge of extinction. The Western Ghats are one of the regions in the country where native mango varieties were first cultivated. But no university or research institute in the area has tried to map the genetic diversity of the local varieties or conserve them. 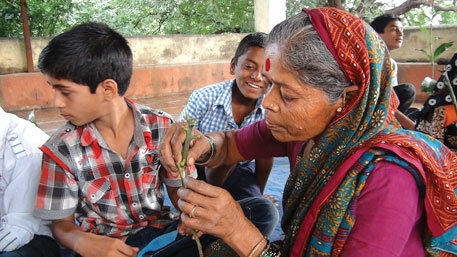 In 2011-12, village-level clubs started under the Maharashtra government’s Western Ghats Special Eco Clubs Scheme, an educational initiative for school children, identified 205 mango varieties in the region. Talking to Down To Earth, Satish Awate of the Centre for Environment Education (CEE), the government body coordinating the initiative, said the findings are not comprehensive and specialised work needs to be done to map and conserve the varieties. Most of the mango varieties identified during the scheme, which is operational in 63 talukas (sub-division) of 12 districts falling within the Western Ghats, are grown in backyards of houses, farm bunds or village community land. People involved in conservation of these varieties say their characteristics and uses are very different. Dinesh Lad, a farmer from Tambakwadi Murde village in Ratnagiri district, has a tree of a variety called Bhopali which gets its name from its large size. The word Bhopali comes from bhopla, which means pumpkin in Marathi. “This mango has a thick skin which makes it suitable for pickles. Because its flesh is sweet even before it ripens, it is eaten as salad while still crisp,” says Lad. Lahu Kalbhor of Pune’s Urwade village says Madhgoti, a tiny, round mango growing in his farm, is in high demand because of its sweet juice. “It tastes sweeter than honey,” he says. A second variety he is trying to conserve is known as Jhaplya, named after the thick shade of the tree. This sweet-sour pulpy mango has a long shelf life and is preferred for making aamras—fresh mango juice—consumed as part of festive meals. Sanjay Waghmare of Tadwale village in Satara district grows Shepuamba, a variety named after the local name for dill greens, a vegetable, because it has a distinctive aroma similar to the greens. Khopriamba, another variety he grows, has hard crisp flesh like that of a coconut, hence the name. Though the demand for Alphonso is more, these local varieties have a market of their own. Most of these varieties, say farmers, fetch between Rs 5,000 and Rs 20,000 per tree every year. “Unlike Alphonso, which dominates mango cultivation in our area,the production and market price of these desi mangoes are stable and the cost of cultivation negligible,” says Kalbhor. But the enormous push by the government and the market to promote Alphonso has led to the decline of these varieties. Farmers say that not only were orchards of local variety mangoes replaced with Alphonso, trees were felled to make crates for transporting Alphonso. During the CEE initiative, only one or two trees could be located for a significant number of the newly identified varieties, indicating that they may be close to becoming extinct. There are other factors at play as well. In several areas, village forests that had mango trees growing in the wild were taken over by the forest department which got mango trees replaced with timber species, informs Awate. Fragmentation of agricultural land is another reason. Fragmentation is difficult to check because families multiply and land holdings shrink, making it difficult for farmers to cultivate mango trees. Some trees can spread over several hundred square metres. Earlier, the government would plant local fruit varieties in public spaces, such as roadside, but the practice has been discontinued. Maharashtra’s Public Works Department does not even have guidelines for plantation along roads. Even where plantation is being done, local fruit and shade-giving varieties like mango, jamun and neem are ignored. Species like gulmohar, and bottle-brush are preferred. These factors make the task of conserving local varieties much more difficult. Also, there is a need to scientifically study and genetically map the newly identified varieties because in rural areas, mangoes with similar characteristics go under a common name. During the CEE initiative, four different specimens in three districts were found to have the same name—Shepuamba. All have the distinctive aroma of the mango but their size, shape and fibre content are different. CEE has taken a two-way approach to save local mango varieties. On the one hand it has approached institutions to encourage them grow local varieties, and on the other, it has taken steps to increase people’s participation. Three institutions—Shivaji University, Kolhapur, High Energy Material Research Lab, Pune and ISKCON (International Society for Krishna Consciousness)—have agreed to cultivate and conserve 25 to 50 varieties in their own grounds. At the people’s level, CEE has engaged with village communities. Urawade village, for instance, has agreed to conserve and multiply locally available varieties. Grafting workshops have been held in several schools to encourage students to participate in conservation efforts. “Since these varieties evolve naturally, they grow best in their native habitat. To promote them, it is essential to conduct research and enhance their economic viability,” says Awate. But this would require a lot of ground work. The CEE initiative covered only 50 locations in the 600 km stretch of the ghats, from Nandurbar to Sindhudurg. There may be many more varieties waiting to be discovered. These mango varieties are extremely important from the point conserving genetic diversity also. The work has to be strengthened and promoted so that these mangoes are available to consumers. What are the contact details of Lahu Kalbhor.